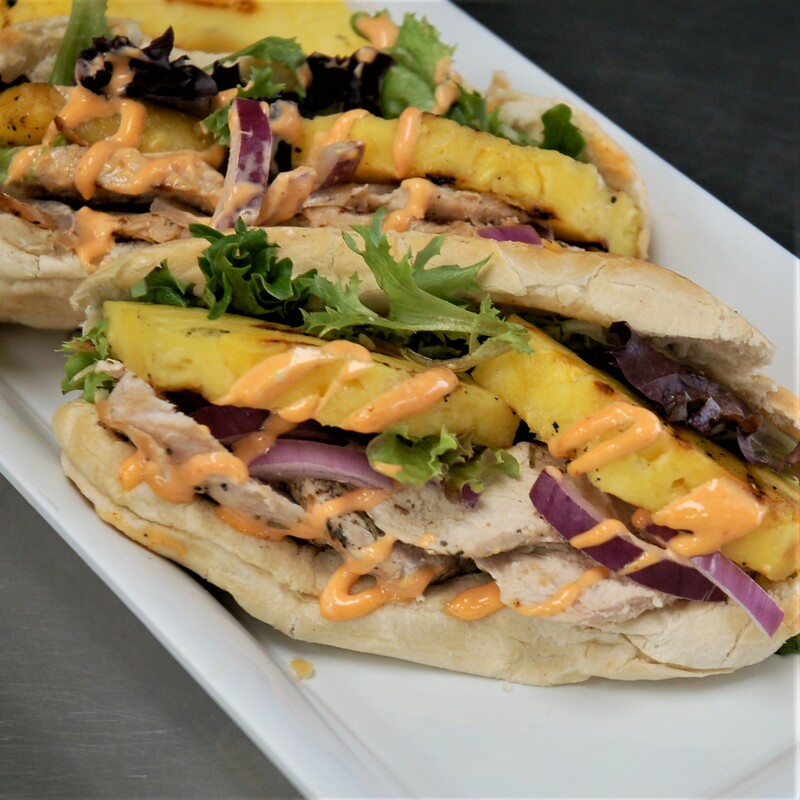 Marinated, grilled chicken & sliced pineapple served warm on a hoagie roll with fresh greens & sliced red onion. Topped with Sriracha Sauce. You told us why you love Aynie’s Catering. Had the homemade tomato soup at a luncheon yesterday and it was AWESOME!!!! Anyie’s is one of our go-to lunch caterers for office meetings! The fresh, healthy items are delicious and offer something for everyone. 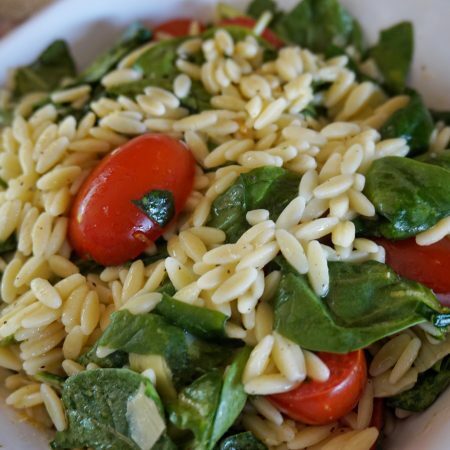 Our summer favorites are the couscous salad and orzo salad! Everyone is friendly and they’re workable with dietary restrictions. We ordered the Breakfast Burrito Bar for a couple office meetings. Everything was delicious. The homemade salsa was excellent. The fruit salad was excellent. Thank you Aynie’s for making our Company meetings a success! Everything was delicious and wonderful and your staff did a great job of setting everything up. It was a very tight squeeze in the room, so we appreciate their patience! And thank you so much for the extra effort on the Pepsi products. Those little things go a long way. The client was very happy. A coworker of mine recently mentioned how good Aynie’s catering is, but that we hadn’t ordered from them in awhile. So, when I was asked to pick a place from which to order food for a recent meeting, I jumped on the opportunity to order from Aynie’s. Since then, we’ve been ordering more frequently. The thing that makes Aynie’s unique is the variety of food they offer. I feel that their sandwich platters have at least 5 different types of sandwiches on them, so there’s always something for everyone. They offer two delicious pasta salads – one with tortellini and one with rotini. The pasta salad is loaded with good veggies, too. Lastly, their dessert platters. Cookies, brownies, cupcakes, lemon bars… lucky for me, the folks in my office aren’t too keen on the lemon bars, so I always have free rein on them! Bottom line – if my office only ever ordered food from Aynie’s, I would be a-ok with that. I highly recommend them for any of your catering needs. We order weekly from Aynies and love the food and the quality. Their desserts are amazing. Each sandwich has a generous portion of meat. Their Creamy Dill Potato salad is the best I have tasted! I did get to try the food after the meeting was over and it tasted fantastic as well. Great job as usual. Thank you for handling the last minute request. I really appreciate it. So I want to make sure I can pass on the highest recommendations possible. Our company ordered breakfast from Aynie’s Catering for a special event and it was great. The eggs, bacon and croissants were hot and delicious, prepared perfectly. The yogurt parfaits are a work of art and the fruit salad was a big hit! Thank you so much Aynie’s for making our surprise event a huge success! Aynie’s is an amazing caterer. We order from them weekly and everything from their food, customer service and reasonable pricing keeps me coming back. I love the Chef salad with the green goddess dressing and I cannot get enough of that cinnamon butter. Thank you for your wonderful services. I have been using Aynie’s Catering for a number of years for both my company’s events and for personal celebrations. Their food is always fresh, delicious and served beautifully. The staff gets my order right, it is delivered on time, and they are very helpful with finalization of your menu. This was our first time using your catering service, the food is great, salads are awesome! Aynie’s is always helpful, easy to work with, and has incredibly wonderful food. They’re quickly becoming the “go to” caterer for may departments in our district office. I order from Aynie’s for our association’s events and classes. Our members rave about the food each and every time. Their customer service is friendly and reliable. I’m making new fans for you. Thanks for making us look good with your excellent catering. 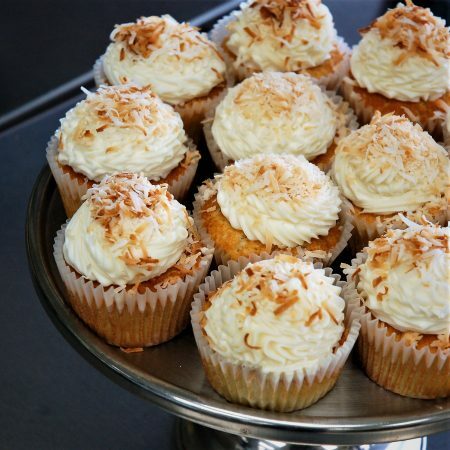 We use Aynie’s Catering for many events throughout the year in our office. 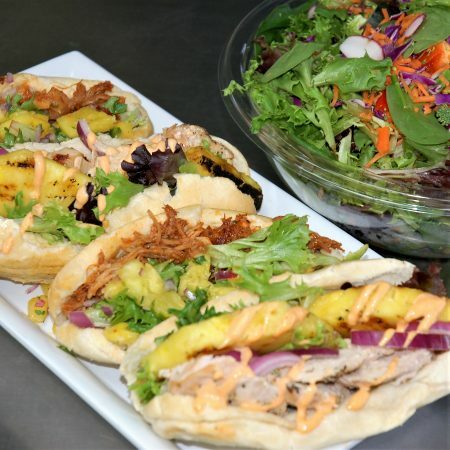 Their food is fresh and exceptionally good, and they offer a wide variety of both cold and hot food options, as well as a wide variety of drinks. Their lemonade is fabulous! Additionally, ordering is easy – either online or via telephone. They are willing to be flexible when it comes to variations due to special dietary needs. They are very timely with delivery and provide easy billing/payment options. I highly recommend them for your next event – whether small or large. Aynie’s Catering has never let me down! They are always prompt and professional and the food is very fresh and delicious! Thank YOU! Hello! Your company catered an event for us yesterday, 9/19/16, and I wanted to send a quick note to tell you how wonderful everything was! Multiple people came up to me to give rave reviews of the food, the desserts, and the fresh lemonade! We ordered the Autumn Sandwich Buffet from the Seasonal menu and everything was so fresh and delicious, unlike the institutional taste a lot of catering companies have making everything taste the same. Excellent and we will definitely be using Aynie’s Catering again!! I use Aynie’s for my client meetings all the time. The staff is great and the food is wonderful. I have never had a complaint. They are one of my top choices when choosing lunch for my clients. We use Aynie’s catering for our office lunches and everyone loves it! The food is fresh and there is always something different on the menu. 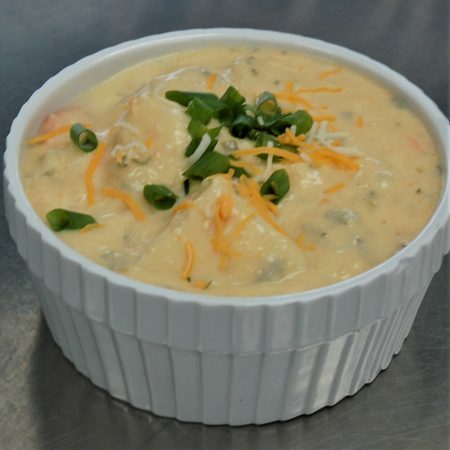 The soups and salads are amazing! We having been ordering for a while now and every order has been on time with everything correct. This is especially nice when ordering for a group of people. No complaints! I’m hearing comments that the food is very good, and also a good variety. Thanks for helping me make this event a little better. I’ll be contacting you for future events, too. Just wanted to tell you, how everyone enjoyed your mini-sandwiches, Chicken noodle soup, salad and dessert tray. The soup stayed hot and was delicious. Everyone had a positive comment about the entire lunch. We use Aynie’s Catering often at the University of Cincinnati College of Medicine. The food is great quality and they always make a beautiful food presentation. You can’t beat Aynie’s for a wonderful experience that everyone enjoys! I have been using Aynie’s catering for quite a few years and each experience has been very positive. They always deliver on time, even when they are very busy. The food is always fresh and delicious. Everything is made to perfection, and cooked to order. Thank you so much for doing a great job on our delivery and set up today. Everyone is raving about how delicious the lunch is! Again, the food was superb. Thanks food was awesome as always this office says best caterer in town! Lunch was fantastic! That southwest salad is the best!!!! And thanks for taking such good care of us on short notice! I got Aynie’s catering for my future daughter in law’s bridal shower. We got the sandwiches and wraps platters and three salads. I can’t tell you how many people came up to me to say how delicious everything was! The food was on time, exactly what I ordered and there was way more than I expected. I took the leftovers home to feed all of my out of town guests who came in for the shower. I would highly recommend Aynie’s catering. Great food and service. As ever, we appreciate working with Aynie’s. The box lunches were delicious and very well received. Thanks also to Spencer, for his prompt delivery and very courteous assistance. I want to let you know that your mini quiche’s and fresh fruit tray was a big success at my early morning meeting. Thank you for making magic happen on such short notice. When Priscilla gave me your name, she sang your praises and highly recommend I use you to cater my next event. Now I can see what she was talking. Again, thank you for doing such a wonderful job. The catering for our Friday 4/24/15 event was wonderful! The food was not only delicious but attractively arranged, and probably the best coffee ever. The elected officials and all in attendance enjoyed it tremendously. Thank you for helping to make this important presentation a success. We hope to do again in the future, and will certainly remember you.